Home / Gear / ‘Ukulele Sizes – Which Should You Choose? ‘Ukulele Sizes – Which Should You Choose? 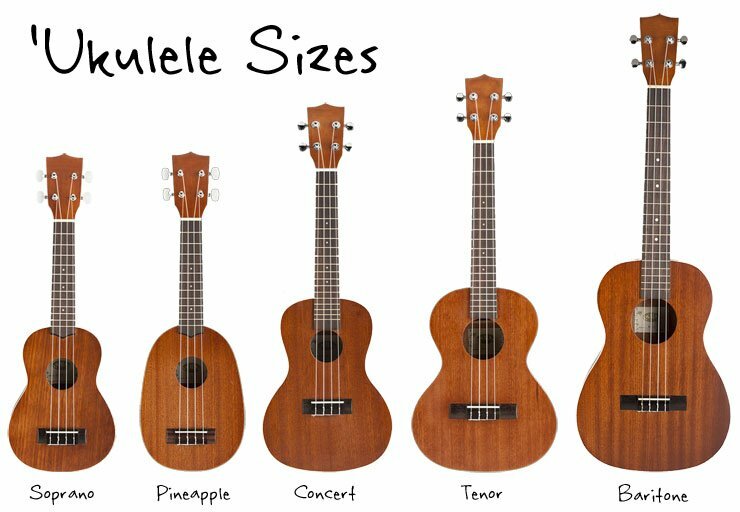 ‘Ukulele sizes mean a lot visually and sonically, but almost nothing when it comes to actually playing music (except for your familiarity with the feel of the instrument). Different strokes for different folks. It’s a matter of personal preference what sized uke you decide to call your own, but hopefully this guide can help you make a more informed decision. Besides the obvious physical differences, sound tops off the list of what makes the ‘ukulele sizes unique. If you have Jake Shimabukuro play the same song on four different tenor ‘ukuleles of similar quality, you would notice that they sound different, but not in a huge way. However, play the same song on a soprano ‘ukulele, concert ‘ukulele, tenor ‘ukulele, and then a baritone ‘ukulele and you’d find a much larger range of sounds. This is due mainly to the resonating space each ‘ukulele has. The smaller the space or surface, the higher the sound. The bigger the space or surface, the lower the sound. Think of a drum kit. Each individual drum functions in the same way, but, assuming everything else is there same, the size dictates the pitch. The ‘ukulele follows the same principle, but instead of producing one note it produces many and the size affects the general tone of the sounds produced. You’re probably thinking that “scale” is a sequence of notes that go “do re me…” That’s one definition, but it also refers to the distance of the ringing string, from the nut to the saddle. The length of the scale obviously changes the spacing of the frets, but it also affects how the strings feel to play and sound. All things being equal, a long scale has more tension than a short scale. Think of a soprano ‘ukulele. It has a scale length of 13-14″ tuned to GCEA. A set of soprano strings are chosen for those tensions and measurements. But put those same strings on a 17″ tenor scale and try tuning it to GCEA and you’ll find that the tuning gets pretty tight before you reach concert pitch. The tension and scale length also affect the tone of the ‘ukulele. A long scale gives the harmonics and overtones more room to ring and thus has a bright, chime-y sound. A shorter scale forces the overtones into less space for a thick, fuzzy tone. The scale, length, and fret specs presented below are just averages. Every luthier uses different dimensions for each of their ‘ukulele sizes. This size fits best in a child’s small hands. If you like ‘ukuleles with a high-pitched, jangle to their sound, the soprano is what you need. Samuel Kamaka came up with this signature variation on the soprano in the 20s. It’s basically the same size as a soprano, but without the waist. The sound is a little bit more full due to the increased soundboard surface area. Vintage Kamaka Pineapples are quite a collectors item these days, but can also be found new from several manufacturers. This size is great if you’re not sure what you want in an ‘ukulele. It’s the Goldilocks size. And if you have small hands that feel stretched on a tenor, the concert still has a full sound with a shorter scale. Scale length: 17-18 in./Total length: 26 in. Tenor ‘ukuleles are becoming more and more popular as people get used to the less-traditional sound. It offers the longest common scale length for GCEA tuning. This makes for a tight string feel ideal for finger picking and any application that needs a stiff response. The tenor is the contemporary player’s size. Because of the wide frets and complex sound, it’s often used to pursue more advanced music. If you have large hands, a tenor will feel more roomy than a little soprano. Because of this the tenor ‘ukulele is a popular performance instrument and it is the size most commonly found onstage these days. Some great tenor players are: Jake Shimabukuro, Herb Ohta Jr., James Hill, David Kamakahi, and Brittni Paiva. The baritone ‘ukulele is the biggest of the lot and the unique baritone tuning requires some knowledge or quick transposing to play familiar GCEA songs. Because it’s tuned a fourth down at DGBE, the baritone is like a small guitar missing the two top strings. This makes it a popular conversion instrument for guitarists looking for some of the ‘ukulele sound and simplicity. Unlike the other sizes, the baritone ‘ukulele is almost exclusively strung with a low top string (linear tuning – low to high). Some of the great jazz players favor the baritone ‘ukulele size because of the big frets that allow them to squeeze chords in way up the neck (Byron Yasui, Benny Chong). Recently a couple of new tuning options for baritone have come to light. These include a high-D tuning that mimics re-entrant standard tuning at a lower pitch and also an octave ‘ukulele tuning. This oddball uses very heavy string gauges to recreate GCEA, but an octave lower than on a normally tuned ‘ukulele. With the advent of the ‘ukulele becoming so popular, companies are pushing the envelope with new ideas and building styles. Some of these include oddly sized ‘ukuleles that aren’t very traditional. Little, itty-bitty, this one. With an 11″-ish scale, a pocket uke might very well fit in a big pocket. It’s popular for traveling around, but takes some nimble fingers to fret hard chords! Just an extra-small soprano with a scale to the tune of 13″+/-. A bass ‘ukulele is essentially an oversized baritone with HUGE strings on it that are tuned to the same pitch as a traditional bass guitar – EADG. It’s much more travel friendly than an electric bass (and especially an upright!) and has a fat, thumpy tone that makes it a fun alternative to its steel string counterpart (though they are making those kind of ukes too now). An ‘ukulele-sized guitar that is tuned to ADGCEA. It’s as if you put a capo on the 5th fret of a guitar.